There are times when I have felt fear in the course of my job as Quaffmaster. However, it's not at the times you might think. Faced with something unknown, green, and foamy? No fear. Got to BevMo right after closing, and fresh out of anything drinkable? No fear. Biotta Digestive Drink? No fear. Okay, well, maybe a little fear. But no quavering! However, if you spend some time in this field, you become aware of a seething underlayer of resentment and hatred, of dark passions and darker betrayals, in which the slightest misstep can bring down DOOM unlike any seen since the fall of Sarnath onto oneself and one's family, yea, even unto the seventh generation. This war has been raging for decades, consuming many who attempted to take stands both heroic and base. Right now, it has retreated below ground, but it is always there, seething beneath our bottle bottoms like magma, ready to burst forth in incandescent fountains of scorching, sticky vituperation. I refer, of course, to the Sweetener Wars. Once, long ago, sweetness was simple. Sugar was sweet, and if you wanted something sweet, you put sugar into it. Sugar could be obtained from any number of vegetable sources. Scientists were delving into its secrets. We knew of the simple monosaccharides; glucose, fructose, galactose, and others of that ilk. Heck, the basis of life itself--DNA, deoxyribonucleic acid--is partially based on a sugar (deoxyribose). And then there were the sweet, sweet disaccharides: sucrose (cane sugar), a combination of glucose and fructose, was plentiful, sweet, and fun. And then we realized that--GASP--sugar had calories! Well, you all know the rest. Saccharin, which ended up being a carcinogen if you ate sixteen gazillion pounds each day. Nutrasweet (aspartame), which has the capacity to become formaldehyde in your body. Splenda (or sucralose), which seems to be a partially chlorinated version of sugar. All of these are sweet but calorie-free, and all of them seem to end up being prone to causing one to grow tentacles or some such. Amongst calorie-enabled sweeteners, cane sugar has been replaced in many foods by high-fructose corn syrup, which is chemically similar to what sucrose turns into in your digestive tract but avoids the need for enzymatic breakdown (and thus one step of control). High-fructose corn syrup vs. cane sugar is currently the major flashpoint in the war. HFCS is somewhat cheaper (sue at least partially to massive corn subsidies) and easier to distribute, so popular with manufacturers. Sugar advocates assert that it is dangerous, and leads to obesity and diabetes. Science is cited on both sides. Tempers flare. Many Weird sodas have chosen to use cane sugar (the story of Dublin Dr. Pepper being an inspiring example). Others use HFCS. And tonight, we will see a representative of a third faction in the battle: agave nectar. Well, let's see. What can we find on agave syrup...made mostly in Mexico, comes from agave, consists of varying percentages of...ah. Oh, and sometimes it's processed with enzymes extracted from black mold. Anyway, tonight, we're trying Oogave Watermelon Cream, which is sweetened with agave nectar--that is to say, a form of natural SUGAR. I like the idea of a watermelon cream, though. And it's been hot this week. Color: A very pale pink. Scent: Very sweet, creamy, slightly bubble-gumish. Taste: Very, very sweet, with bubble gum being the strongest initial taste. That lingers for 5-10 seconds, then a tart fruit taste comes slowly in. I don't detect a lot of watermelon, and the cream is strong and synthetic-tasting. For something made entirely of natural ingredients, this tastes very artificial. I guess there's a hint of watermelon in the tartness, but it's faint. I can't actually say that I much care for this. Too bad; I like watermelon, and I like cream soda. Thi is not really either; it's a bubble gum soda with a faint hint of watermelon and aluminum. Quaff rating: 2.5. Not all that good. Cough rating: 0.5. Not all that bad. 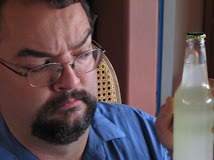 Some time ago, we reviewed Sidral Mundet, a very pleasant Mexican apple soda. It was a fairly accurate apple taste, including some of the slight bitterness of the peel, and was most enjoyable. except this time, they had a variety of Mundet I hadn't seen before. Mundet Manzana Verde. Manzana Verde translates as "green apple". If it's as good as their "brownish apple" variety, I'll be very happy. Color: light pale green. The bottle has an apple embossed in the glass. Scent: A fairly light green apple scent. Not overwhelming. Taste: Cool, slightly tart, definitely apple-ish. Very similar to the brown apple, except with more tart and less mellow. A nice complement to the other one, actually. The Mundet family always feels somehow classy to me. They're understated and pleasant, not too cloying. Very nice. Interestingly, the ingredients list mentions that it includes both citric and malic acid. Malic acid is common in fruits which aren't quite ripe; hence the "sour green apple" flavor? Cough rating: 0.5. Slightly tarter than I like; feels like it's attacking my teeth. I was pleased with Americana's black cherry soda, which we reviewed at the Heart of Weirdness on Earth, the Madonna Inn. When I picked it up at Galco's, I noted that Americana also made a root beer and a ginger ale. We now have both, and tonight I'll try the ginger ale. The bottle is interesting. The label is metallic green and gold--pretty--with a portrait at the top, over the brand name. In this case, the portrait is of Ulysses S. Grant, and is titled "Portrait of Americana". I'm not sure Ulysses S. Grant is, in and of himself, representative of all Americana, but we'll take him as a single datum in the Americana set. The label also includes a blurb/history, which begins with the sentence "The era of soda poppery began in the early 1900s." I have several reactions to this. First, I intend to start using phrases like "the era of soda poppery" as often as possible. Second, I have seen several examples of soda poppery which claim to be from the mid-to-late 1800s, which brings the claim of soda poppery commencement as circa 1900 into question. I foresee a conflict between young-Poppery and old-Poppery Soda Creationism (along with the Carbonated Evolution faction). The label further designates this soda as being a "Spicy Ginger Blend" with "Zesty Ginger Ale Flavor". I'm beginning to think I should be drinking this with some fried calamari rings. The Kibbitzer-in-Chief is intrigued by the soda. "Honey lime ginger ale..." she muses. "What an interesting combination of flavors. I might even go so far as to describe it as a 'union'." Color: Ginger ale colored. Maybe slightly darker than some. Scent: Like an extra-gingery ginger ale. K-i-C: "Mmm. It smells good from here." (picks up the glass, smells) "Aah. Not so good from up close. It stabbed me in the nostril!" Taste: Initial taste is fairly sweet, with a moderate ginger bite which comes in a few seconds after the initial taste. There's an odd feeling; I taste it mostly on the sides of my tongue. Not sure why. I think I get the honeyish taste just after the ginger bite, which does linger and burn a bit. The ginger is most prominent on the soft palate and back of the throat. The ginger is surprisingly strong, as it comes forwrd. Punctilius says she gets something cherryish (but not really) in the taste. K-i-C: "The honey and lime might interact to make that...in their union." Unions seem to be on the K-i-C's mind. It must be the portrait of Grant on the bottle. I'm still trying to figure out the unusual taste which comes between the initial sweetness and the ginger bite. It's mostly sweet, but with a little bit of earthy or savoriness to it. It's very faint. I'm not sure why my brain wants to call it "cardboardy", but it does. It's pretty nice. A pleasantly sweet, interesting ginger ale. Quite gingery. The ginger is quite strong in the middle and later tastes, and lingers long. In fact, it's still getting stronger. Punctilius is commenting that her lips have begun to burn--five minutes after she finished her cup. The Zestiness of the brew! THE ZESTINESS HAS MY SOUL! Quaff rating: 3.5. A nice taste. Cough rating: 1.0. Poked the K-i-C in the nose, which was rude. We’re dedicated scientists here at the Lab. We spend our days* bent over our benchtops, engaged in deep gustatory meditations, or on local acquisition and sampling exhibitions. However, even such dedicated scientists as we occasionally benefit from a change of venue. Prior to becoming a Quaffmaster, I spent some time as a graduate student and researcher in the biological sciences. It’s an interesting lifestyle, with many perks as well as costs. One of the nice bits is conference travel; you do some sort of interesting work, submit it to a conference, and get the institution to pay for you to zoom off to some destination with hundreds or thousands of other scientists, spending a few days absorbing vast amounts of research during the day (and presenting your own), and engaging in elevated scientific discussions far into the night**. Well, now that I’m a Quaffmaster, I sort of missed the whole conference travel bit. Unfortunately, there aren’t any conventions in the Weird Soda world (well, none to which I’ve been invited at any rate). So we, the staff of Weird Soda Review, decided to do our own travel/pilgrimage/quaffing exhibitions. A big decision remained, though—where to go? As a grad student, my field had conferences all over—New Orleans, Japan, New York, Australia—but our travel budget at the Lab is a bit more limited than the University of California’s. So we needed to keep it within a few hundred miles, reachable by the Lab’s transportation arrangements*** and budget. And, of course, it needed to be Weird. And we found the perfect place. The Madonna Inn. If you’ve never been to the Madonna Inn, please allow me to assure you that it is possibly the Platonic paragon of Weirdness on Earth. It’s a resort hotel, in which all of the rooms are individually themed and decorated by some sort of mad genius. There’s the Caveman room (complete with walls, floor, and ceiling made of blocks of granite, a rock waterfall shower, and a stained-glass window with a caveman) , the Daisy Mae , the Buffalo Room, the Love Nest…etc. In the main building, the men’s restroom includes a gigantic urinal made of boulders, which automatically flushes via a ceiling-to-floor waterfall. and a huge portrait of one of the founders of the hotel in a pink evening dress…with an accordion. This place is obviously ideal for Weird Soda reviewing. On our trip up, we made side pilgrimages to Galco’s in Highland Park and Mitsuwa in West Los Angeles, picking up supplies. We then journeyed a few hours north to the Madonna Inn. and a bathroom with rock floor and walls (except for the one which is mostly fuzzy zebra print) and a waterfall shower. After extensive tasting preparations (which, coincidentally enough, took place in the hotel hot tub), we brought forth the two Weird sodas which had been specially selected for the honor of quaffing at this most Weird of Weird Locales. This one was recommended to me by frequenter commenter Cameron, who has provided several excellent suggestions and technical help (the technical know-how to create and link up our new favicon was provided by him, for which we at the Lab lift our special tasting glasses to him in salute). I was very pleased to be able to obtain a bottle of it (long with many, many other Weird sodas) on this pilgrimage. He described it as the best cherry soda he’d ever had. iven my love of cherry soda, this is clearly a must-quaff. This is part of Orca Beverage Company’s “Americana” line. Also in that line is a honey lime ginger ale and a root beer (which we did also acquire). Like most of Orca’s products, these are cane-sugar sweetened, with lots of natural ingredients (this one lists dark sweet cherry extract as the third ingredient, after water and sugar). I’ve had their NuGrape, and found it yummy. Given that this uses actual cherry extract, I’m not sure what to expect. It may not be either the medicinal cherry or the popsicle cherry flavors I have experienced in the past. Something new? We’ll have to see. I am feeling inspired by this environment. Truly, the Madonna Inn lends extra Weirdness to all within its sphere of influence. Taste: Complex. There’s an initial sweet, but it’s followed by a complex tartness. It is strongly reminiscent of dark cherries, quite fruity. Not a blinding wall of sweet synthetic cherry like a cherry popsicle (not that that’s a bad thing), this is what a cherry Popsicle would be after having gone to college for a couple of years. The aftertaste is also very fruity; tart/sweet, with the slight bitterness you get in peels of things like grape and cherry. The lead assistant tester likes it, although he fears that the burst of tartness would be off-putting to some. I agree up to a point, but I think it’s more realistic than that—the tartness is more like real cherry. She modifies her opinion to indicate that it tastes like dark cherry pie topping. There is definitely the heady taste of cane sugar here, most detectable when it is slightly warmed. Good stuff, quite a bit more tart and complex than I expected. Cough rating: 0.5. The tartness is good, but very surprising. UPDATE: I’ve just had the last bit from the bottle, without the benefit of cooling (room temp). The syrupiness is more evident, with the tartness more immediate but less intense. It lingers oddly, becoming quite sharp. The cane sugar lightheadedness is even more prevalent. It’s closer to medicinal cherry when warm. Perhaps that’s one of the unspecified natural flavors. Our second Weird soda for tonight is “The Original Mabi Drink”. What, exactly, is Mabi, you ask? I have no idea, and I don’t want to pay the $9.99/day that internet access would cost me in this room. So until I can mosey over to the lounge where its free, I am stuck with speculation. The ingredients list includes water, high-fructose corn syrup, and—and I quote—“Natural Mabi Bark Flavor”. Apparently, Mabi is bark. This is bark-flavored soda. I suppose birch beer is too, but…I’m not sure about this. The label also says this is “The Authentic Caribbean Flavor”, and bolsters its claim with a yellow cartoon of some sort of figurine or fetish and a bunch of flags which I presume are from Caribbean nations, states, or territories. Elsewhere on the label, it mentions that this contains less than 0.5% alcohol by volume. I think it’s safe to presume that it contains some small amount of alcohol. So what we have here is a hooch-soda containing bark from some Caribbean plant. Color: medium pale orangey-brown. Kind of brandy-ish. Scent: vanilla and vinegar. Faint, but strange. It does smell a bit like alcohol, which is a little hard to believe if it’s really less than 1 proof. Taste: Bluh. Faint at first, then hits your tongue with a faintly oily, lemony taste which my brain insists on calling “clayey”. Yes, like modeling clay. No, I don’t know why. I’ve had very little in the way of liquor, but I think it tastes a tiny bit like amaretto. The K-i-C thinks it’s more like Tuaca. Junior Assistant Tester: “I kind of like it!” We’ll have to watch out for him. Lead Assistant Tester: “Eww.” *puts it down* I think we’re safe with him. If I didn’t know better, I would think this was some sort of liqueur. It really is reminiscent of hooch. I feel as though I should be mixing it with something. When drunk warm from the bottle, the lemon taste is stronger, but the hoochness is still there. I’m not sure whether that’s good or not. Quaff rating: 3. More or less pleasant. Those who like Tuaca might rate it higher. Cough rating: 1.5. Oily and liquoresque. Clayey, I swear. ** Many of these discussions involved quaffing. A lot of quaffing. And not soda. *** 1998 Toyota Sienna minivan. It has running boards and a spoiler, so it’s cool. We've encountered some pretty foul stuff in the Weird Soda quest. Notable on that list is Biotta Digestive Drink, a product of Switzerland which I described as the beverage equivalent of a war crime. However, shortly after we reviewed the Biotta, I had an opportunity to share some with occasional contributor Punctilius. Amazingly enough, she was able to stomach it--even, almost, to enjoy it. 2) Throw (literally) the juice at the back of your throat. If possible, make sure none lands on your tongue. 3) Swallow using the K'n-Yan technique, developed by the pharyngeal masters of ancient Mu, which enables the practitioner to clear not only the substance swallowed from the tongue completely, but also to remove the very memory of the substance consumed*. Punctilius' admirably concise description of Noni: "It tastes like barf." This is the curse of the Quaffmaster: when faced with something which makes the one who could quaff Biotta quail, I must quaff that something. I must. The stuff comes in a plastic bottle shaped somewhat like a crematory urn. This particular one is called "Naturally Noni 2x". The 2x refers to the fact that it is apparently "double strength". Prominently featured is a painting of what I assume to be the Noni berry; the exterior of the fruit is green and covered with what look like octopus suction cups. The back of the bottle lits the suggested use as consumption of one fluid ounce daily. This is a Weird drink with a dosage. It also suggests that you consult a doctor before drinking it if you are pregnant or taking medication. This is serious stuff. Color: Brownish, semitranslucent, fairly thick. Scent: Yech. Fermented, fungal. There's a kind of thick sweetness, but a strong bitterness over it. Cheesy, but not sharp. Taste: Strongly cheesy, but more of a swiss or Limburger than cheddar. There's a berry-ish taste, similar to blackberry, but the cheese/fermentation overlay is overpowering. Not being a K'n-Yan initiate, I am getting the full force of the taste. It's not exactly barflike, but it's pretty nasty stuff. The aftertaste is much like the aftertaste of a berry smoothie, if it were eaten with a Limburger bagel. If you made a blackberry smoothie and added some fairly salty Swiss cheese, you'd get something like this. On the other hand, it's not nearly as bad as the Biotta digestive drink. Punctilius says otherwise; she would rather have the Biotta. I have to disagree. I certainly wouldn't seek it out--it's quite unpleasant--but I've had no urge to upchuck. Quaff rating: 1.5. The berry taste is OK, but not the cheese. Cough rating: 3.0. Foul, but not unbearably so. You have to admire a weird soda with such a succinct name. "Quench". And so evocative! "To quench" can have any number of implications. Perhaps this soda is going to quench our burning passion? "Oh, Ayla! Never in my manly wanderings through the Pleistocene landscape have I met such a woman as you! And I've met a lot of them. A LOT." "Oh, Jondalar! In all my time bridging gaps between hominid species, inventing sports bras, domesticating horses and lions, and becoming psychic, never has a man made my innards quiver as you do." "Hey, what's this bubbly drink?" Or maybe it's meant to refer to quenching metal, as in a blacksmith's forge. "This sword, representative of the finest work of the Japanese sword-crafter's art, exhibits a multiple-fold pattern welding along the blade. The full tang extends through the handle, and the wrappings are of the finest silk. And as a bonus, the blade has a light, refreshing grapefruit flavor imparted during the forging." I used to work in an MRI lab, and learned a somewhat more unusual use of the word: quenching a magnet refers to stopping the flow of current through the superconducting coil by raising part of it to non-superconducting temperatures. The currents in a typical clinical or research scanner are pretty substantial, and the magnet is cooled by liquid helium. Quenching it results in that current all being transformed into resistive heating of the coil, which boils off the liquid helium very quickly, producing a huge amount of very cold helium gas which has to be vented out of the scan room lest it asphyxiate everyone in it. I'm not sure how, exactly, "Quench" soda could be referring to this sense, unless it makes your voice really high and kills you by suffocation. We'll hope not. Or maybe it's supposed to quench your thirst? Nah. Boring! Incidentally, this is a cane sugar soda from Orca Beverage Works. Color: Almost clear. Slightly hazy/foggy, but not so far as cloudy. Scent: Sweet and mildly citrusy. Taste: Quite sweet, but light. Fairly refreshing. Not very citrusy--it's fruity, but the fruit is more berryish. Maybe a very light strawberry-orange. Pleasant. Definitely not grapefruit. Kind of reminiscent of lemon-berry smoothie. Quaff rating: 3.5. Pretty nice! Cough rating: 0.5. Slightly oversweet, but just barely so. Weird Soda doesn't have to come from others. It is entirely possible to make Weird Soda oneself. In fact, one can buy kits for this very purpose; for a small fee, a company will send you the appropriate equipment and materials to brew your very own beer or soda. It's my impression that most of the sodas which one brews with this sort of equipment are of the root beer variety. It is my further impression that successfully brewing anything more drinkable than sludge dragged up from a river bottom is difficult at best. This impression is based on an unpleasant experience I had involving someone attempting to brew beer in such a contraption. It did not go well. In the same way that a vacation which ends in paying too much for your airline fare, having to sit next to two sumo champions fresh out of a match, the in-flight movie being "Dennis the Menace", and finally having your airplane shot down over waters teeming with voracious giant squid could also be considered to have gone badly. Given that, the fact that Red Ribbon has made what claims to be "Home Brewed Style" root beer does not make me tremble with joyous anticipation. On the other hand, Red Ribbon makes a darned fine Cherry Supreme soda. Let's give this a shot. Color: dark caramel brown. Maybe slightly more orange than some. Scent: Interesting. Spicy, with a sweet/tart scent, not too dissimilar from candy orange slices. The Kibbitzer says she smells a lot of vanilla, "good Bourbon vanilla". I don't taste it much. Taste: The initial taste has a bit of cinnamon, but sweet and oddly faint. The root beer is mild, and fades quickly, replaced by...not much. There's very little aftertaste, just a bit of sugar. K-i-C: "It tastes like the dentist." K-i-C: "I can still taste dentist." This is all right--the initial taste is pleasant and mellow. But I'm disappointed at how quickly it fades--I'd be interested in seeing what else might be in there. There is a faint aftertaste of wintergreen, like birch beer. Quaff rating: 3.0. Meh. Enjoyable enough, but surprisingly bland. Cough rating: 0.5. Nothing wrong with it, but not impressive. Vavo ginger ale comes in a clear glass bottle. The label is grey/silver, with a stylish black band around the bottom. The name "VAVO" is inscribed in bold lettring. The whole thing gives a serious Art Deco impression. I don't really feel dressed well enough for this soda. It's a cane sugar soda, which is promising. The ingredients list is short; water, sugar, citric acid, and ginger extract, along with a few other natural flavors and preservatives. However, like other highly stylish sods, a manifesto on the label is de rigeur. Vavo claims to be "a modern refreshing soda with a hint of real ginger and a touch of sweetness. This drink is created from passion and with quality you can appreciate." I'm not going to speculate on what it means for this to be made with passion. Color: Silvery. By that I mean grayish and translucent. Scent: Lemony, with a very strong ginger. Taste: Oddly oily. The lemon is very strong; with the slightly oily thickness, it's a little like liquified lemon goo (like you find in lemon meringue pie or lemon bars). The ginger is also strong. There is a mild-to-moderate pleasant sweetness. It's sweeter than the label implies, but not overly sweet. This tastes a fair amount like other real-ginger-containing ginger ales, with the addition of a strong lemon. If you mixed the sauce from cheap takeout lemon chicken with regular ginger ale, it might be something like this. The Kibbitzer-in-Chief likes it. She says it's like a "Vietnamese-style lemonade", with the strong ginger. Quaff rating: 3.0. Pretty nice. Cough rating: 0.5. The lemon is quite strong. The Weird Soda Review Labs are (or try to be) bastions of scholarship* in the field of Weird Soda research. If there is an "ivory tower" of academia, I suppose we're the "scratched plastic pitcher" of carbonated beverage study. Thus, when we visited the Galco's Institute in April and found Journey's "John Barleycorn" root beer, we had to procure a sample for analysis. Why, you ask? What's so special about this? About the soda, I have no idea. Never tried it. But John Barleycorn is a fascinating figure. In the rest of the song, Mr. Barleycorn is variously threshed, roasted, smashed, burned, and eventually killed. However, his body is used to make beer and bread, which can then be consumed, giving life to others. We literally eat of his "body" and drink of his "blood", and gain life thereby. The similarities of this story to the life of Christ--and to many other stories of sacrifice, death, and rebirth--need not be elaborated. Barleycorn is a mythic figure representing life, death, and rebirth, and the harvest cycle. However, apparently, in the earlier versions of the John Barleycorn songs--as in the older stories of figures of death and rebirth--the story doesn't end there. John Barleycorn is reborn/resurrected, and opens up a can of whoop-a** on his persecutors. He wreaks vengeance upon them in a serious way. Again, the parallels to consumption of the products of John Barleycorn's death (namely beer and whiskey) are fairly obvious. I think that another name for hangovers should be "the inevitable vengeance of John Barleycorn". Obviously, the story of Christ represents a different take on the more traditional stories of sacrificial death and rebirth. Jesus didn't come down and take vengeance upon the people of Judea after his death, right? "When the day of Pentecost came, they were all together in one place. Suddenly a sound like the blowing of a violent wind came from heaven and filled the whole house where they were sitting. They saw what seemed to be tongues of fire that separated and came to rest on each of them. All of them were filled with the Holy Spirit and began to speak in other tongues as the Spirit enabled them." Acts 2:1-4, New International Version. Seen through the lens of John Barleycorn (and possibly Roland Emmerich), I could imagine this as heavenly plasma cannons, and what they were speaking was "AAAAAAAGH! MY HEAD IS ON FIRE! AAAAAAAAAGH!" As the Kibbitzer-in-Chief--whose academic training is in literature--puts it, "anyone who has seriously looked at nature and natural cycles knows that nature bites back." So when we found Journey's John Barleycorn Root Beer, we felt we'd better give it a try. Actually, we're kind of afraid to give it a try, given the discussion above. Further contributing to our apprehension is the "Historic Brew" label on the bottle, and the fact that the image is of a man's face emerging from the wood of a barrel. It's reminiscent of "Green Man" pagan imagery, and messing with the Green Man generally involved an unpleasant ending. But being struck down by the ancient pagan spirit of sarsaparilla is just one of those occupational hazards of being the Quaffmaster. Color: dark brown, pretty normal. Scent: Wow. Nuts, spices, licorice. The K-i-C votes for "meaty". She's not wrong. Complex and bizarre, not much like regular root beer. Taste: The initial taste is not unlike root beer, but almost instantly a very tart/sour taste comes out from under that initial taste. It's quite strong, almost lemony. The initial taste has spices, cinnamon and nutmeg, but that citrus is very strange. Lead Assistant Tester: "I like it!" K-i-C: (shudders, winces, makes an "oh God" face): "I don't like it. It's a regurgitation sensation." The licorice isn't as evident in the taste as in the scent, but it comes through under the lemon. To me, the strongest tastes are of nuts, cinnamon, nutmeg, and lemon. The ingredients list is very interesting: water, "natural sweetener blend", fructose, cane sugar, extract of malted barley, essence of wintergreen, citric acid, natural flavors". I can't directly taste the wintergreen, but I'm assuming the barley is the nutty flavor. It's actually kind of chocolatey. Once again, Journey puts out a strange, distinctive, and controversial brew. Between this and their "Caribbean Creme", I think they may be the Kibbitzer-in-Chief's least favorite beverage company ever. Quaff rating: 2.5. Complex and interesting, but not very pleasant. *And by "scholarship", we mean "willingness to skim over Wikipedia entries". I've often found the qualifiers applied to food products and flavors interesting. My personal favorite is "Fancy" ketchup. I've noticed that, in general, the little ketchup packets one gets with drive-thru fast food are labeled as "fancy" ketchup. What, exactly, makes it fancy? In what way does it differ from other ketchup? Can you ask for something else? "Yes, please, but I don't really feel worthy of the fancy ketchup. Could you make that the 'plebeian' ketchup?" "I'm sorry, sir, we're out of plebeian. We have 'unadorned' and 'quotidian', though." There are other examples. And then, there are the qualifiers which denote changes in a product's formula. New Coke, for example. Or Pepsi Throwback, for going the opposite direction. I think it might be fun, given a successful brand, to put out a new label which indicated that no changes had been made whatsoever. "Ask your doctor if Tagamet HB: Static is still right for you." "Try our newest offering, the McSameAsBefore. The burger you loved...still." "It's Doritos X-TREME Immovability...still in Nacho Cheese flavor!" Well, in this case, we have NuGrape. This is a product of the Orca Bottling Company, who specialize in cane-sugar-based old-style glass-bottle heavily-hyphenated soda. As to what makes it "Nu", I am unclear. The bottle proudly proclaims "Since 1921", which is not particularly Nu in my book. It also describes itself as "A Flavor You Can't Forget". This, perhaps, explains is; those who first tasted it in 1921 are still--to this very day--experiencing the flavor as Nu. Or perhaps I've missed the whole point. Perhaps "Nu" does not refer to its novelty, but rather refers to the Greek letter "nu" (or ν), which refers to frequency (of electromagnetic radiation, for example). They're hoping for a high-frequency-of-drinking soda. Color: Very dark purple. Bluish-purple, like a very ripe blueberry. Scent: Allow me to quote the K-i-C, who did not, in fact, smell it, but was simply in the same room where I poured it. K-i-C: "Eugh. Ugh! Oh, God, that reeks." It does have a rather strong smell, similar to other grape sodas but stronger. It smells a bit like fruitcake, actually. Yes, the kind with brandy. A very rich aroma. K-i-C: "It's stinking up all my air. Drink it, fast!" I don't mind it as much, but the K-i-C really hates the smell of this stuff. Interesting. Taste: Oddly, the first thing that comes to mind when I drink it is not grape, but bread. I'm not sure why. There is a definite synthetic grape flavor (although less synthetic than some--although this has no grape juice, it simulates grape juice better than most sodas). The initial taste goes through some complex sweet shades, then moves into the mid-taste, which is--again--bready. I'm not sure how else to describe it. It's deep, complex, and mildly sweet, but with some amount of non-sweet taste threaded through it. It's both less sweet and less acid than a typical grape soda. Deeper and richer. More foodlike. It's pretty good, but more dangerous; this is a soda which might interact badly with some foods. And some spouses, apparently. I'm enjoying it, mostly. There's something in the mid-taste which is very strange. It's not bad, but it's insistent; I can't ignore it. The aftertaste is a bit tart, and almost savory. It doesn't taste like mushrooms, but it doesn't taste completely unlike them, either. Weird. I'll have to mull this one over. Quaff rating: 3.5. Interesting, pleasant, and very distinctive. Cough rating: 1.0. The complexity of the taste includes some thing which may not belong in soda.